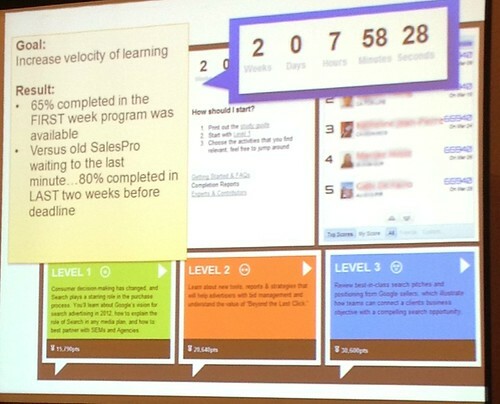 After discovering that 80% of employees were putting it off until the last minute, Google used social media and gamification to reinvent their internal online sales training program. They scrapped their conventional online course and developed a new, custom online training where participants can earn points and top rankings by contributing answers to sales-related, essay questions in a game environment with an activity stream, levels and a leaderboard. They call their new course SalesPro+. In their original training, the right answers to questions were all predetermined by one subject matter expert. But when they added the social network, they realized it served to procure a veritable subject matter network of answers and on-topic discussions, all of which were contributed by the game’s actual participants. So rather than be entirely instructor-led, the participants built their own storehouse of subject matter expertise, debating the finer points amongst themselves. Social interaction allows for more immediate feedback, and that feedback motivates engagement. Social networking solves that problem, be engaging participants in discussion. But the use of social media in eLearning brings it’s own set of risks. Partnering with a friend can be a great way to lose weight or quit bad habits. But when the person you’re partnering with has to be a subject matter expert, social networks pose real challenges, because the most popular people aren’t always the most knowledgeable. Demagogues are skilled at using social interactions for self-promotion, but they may also lack depth and experience. Their ignorance could easily result in highly recommended, albeit misguided, advice being seen are worthwhile by participants. “Would you rather be mentored by a friend or an expert? A mentor shouldn’t always be the person who’s most available or the person you know, but the person who really has expertise and credibility,” says Michael W. Allen, chairman and CEO of Allen Interactions, who is largely regarded as the father of the eLearning industry. Google SalesPro+ attempts to solve this problem by overlaying a voting feature on answers posted, in hopes that the community will recognize and reward the top answers. If you leave an answer that gets the most votes, it not only ranks highest, but you also receive a personal, congratulatory email from the SalesPro+ training team, and your manager is cc’ed. At Google, which attracts Ivy League college graduates, this may be of less concern. But adapting the same training approach for use at other organizations could be dangerous. Perhaps a flipped classroom approach, where a reliable subject matter experts guide participants through exercises after the on-demand module has been completed could be used to keep misguided advice from becoming company gospel. Social networking isn’t the only hot trend in elearning design these days. By applying game mechanics, Google also increased consumption seven fold. But at what cost? Time is an expense. Online trainings need to build skills quickly. Games can be engaging, but if they’re just entertaining and don’t actually build skills or increase retention, they fail. The amount of learning that occurs by the amount of time invested is what determines not just the effectiveness, but the fiscal prudence of an online training initiative. SalesPro+ was pieced together using Google Sites, Google Gadgets, Google+, Google Forms and Google Analytics. And the community and gaming features increased consumption by a factor of 7. If the increase in time spent also improves retention, and ultimately the sales person’s close rate, then the added time off the job to complete the course is a very wise investment. Those numbers are yet to be recorded but one thing is sure. Google increased consumption and retention of their internal online sales program exponentially bu integrating social networking and gamification. Eric Schwartzman is an Online Social Media Training provider. His Online Social Media Bootcamp, which includes lifetime access to a comprehensive knowledge base of key concepts, how-to tutorials and best practices, is available at a special introductory rate through the year end. 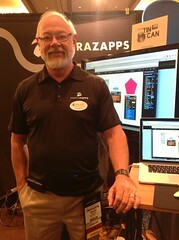 This post was written from interviews conducted at the eLearning Guild’s DevLearn 2012 in Las Vegas.